Across sub-Saharan Africa, there is an enormous demand for health and medical books and for training to make resources accessible. 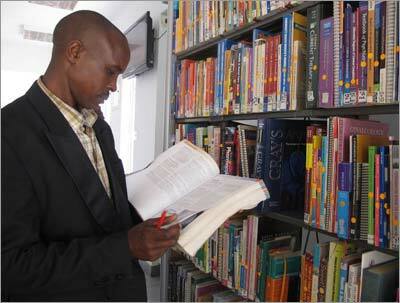 A 2011 report by EIFL titled Perceptions of Public libraries in Africa surveyed library users and non-users, librarians and officials in Tanzania, Ethiopia, Ghana, Kenya, Zimbabwe and Uganda and revealed overwhelming support for the role that libraries can play in development. Only one out of five people surveyed said they would expect to find health information in a local library. The report recommended that "libraries need to engage with the community at a more tangible level that goes beyond passively providing books information only, e.g., facilitating community interaction with service providers of health, agriculture and culture." 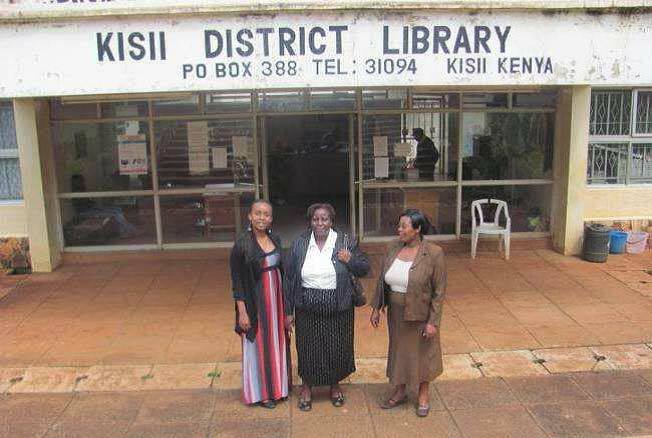 To this end, Book Aid International has spent three years working with Kenya National Library Service (KNLS) on a project to establish Health Hubs in 15 branch libraries, with funding from the Elsevier Foundation's Innovative Libraries in Developing Countries Program. Our project was a direct response to findings such as these; it targeted KNLS librarians so they could identify health information needs in their own communities and provide primary healthcare providers access to relevant, trustworthy and up-to-date information in public libraries. "KNLS recognized the urgent need to improve healthcare information for health workers in order to meet some of the challenges of providing book public health services in Kenya," said KNLS Project Coordinator Caroline Kayoro. She said that through providing Health Hubs in 15 public libraries, training librarians and health workers, increasing book stock and providing access to health information online, they have seen library visits and book issuing increase by 10 percent. KNLS selected 15 of their 60 libraries based on their geographical spread, proximity to hospitals, clinics and medical training colleges and available space for a dedicated health section. Healthcare staff in the vicinity of these libraries access information regularly, and usage statistics show high demand for medical books. In total, we trained 30 KNLS branch librarians (two from each library) and equipped seven KNLS staff with additional skills to serve as master trainers. Ten local health providers also took part in the annual training workshops. 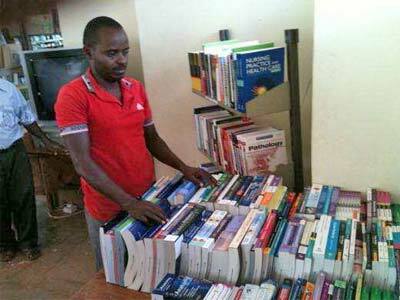 Over 7,000 high quality donated health and medical books were provided by Book Aid, with additional and relevant primary healthcare titles purchased locally by KNLS. Workshop participants engage in active learning, which encourages discussion and problem solving. This includes sharing their own experiences using activities such as simulations, making training enjoyable as well as informative. 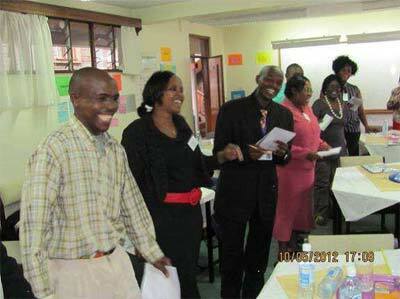 A team from Book Aid International and KNLS facilitated four-day training workshops in a residential center in Nairobi. Workshops were highly participatory. In one activity, participants were divided into small groups and given a task and present to the rest of the group in a plenary session. Buzz groupswere also used, pairing people so they could discuss an issue or task in depth and agree on a common response to present to the rest of the group. Individual thinking was also a feature, allowing each participant time to reflect, make notes and share their responses to particular ideas or issues. Identifying librarians with the potential to train other librarians was also a key feature of the workshops. Starting in the second year, local health workers were involved in the workshops. The training was an important part of the project. We asked librarians to prepare for the workshops and to do a presentation based on their experience of meeting health information needs. That gave us the basis for a discussion on who they were already reaching, how much more could be done to set up health partnerships in their locality, and common diseases where improved information could make a major difference to healthcare in their areas. Setting initial goals for each library meant that each librarian produced an action plan at the workshop. Given the rapidly expanding availability of computers and broadband in Kenya, the workshops also trained on accessing online health information. Although the degree of access and speed varies among libraries, they are clearly becoming important centers for accessing the most up-to-date health information online and in print. We also set up focus groups with local health organizations to assess their health information needs, using an information gathering tool designed by the project team. In some libraries, local committees were quickly formed. Local partnerships between the libraries and health providers include doctors, nurses, anesthetists, laboratory technicians, public health workers, representatives from local medical training colleges, district public health officers, hospitals health education officers, youth peer group counselors, local NGOs, public healthcare workers, and medical personnel from neighboring dispensaries, including prison dispensaries, which provide outpatient services for simple ailments. Since 2004, Elsevier has donated about 260,000 scientific, technical and medical books to 211 partner institutions in developing countries — including 20,000 books to Book Aid in 2013. Elsevier is Book Aid's largest donor of medical books, with 90,000 donated to date. Donating print books through Book Aid complements Elsevier's involvement of Research4Life, a free and low-cost online research access program for developing countries. Book Aid's high-priority areas include agricultural and biological sciences, chemistry, dentistry, energy and power, engineering and technology, environmental sciences, health professions, immunology, life sciences, mathematics, medicine, nursing, pharmaceutical sciences, pharmacology and physics. The Health Hub has been of great importance to me as an individual, and to the vast number of health workers in Nakuru. I know of colleagues who have also travelled from Naivasha, Eldama Ravine and Molo Districts to use the facility. … It has long been a dream for the universities and colleges offering medical training in Nakuru. 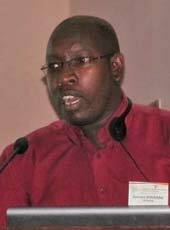 James Kimani is Book Aid International's East Africa representative, based in Nairobi, Kenya. 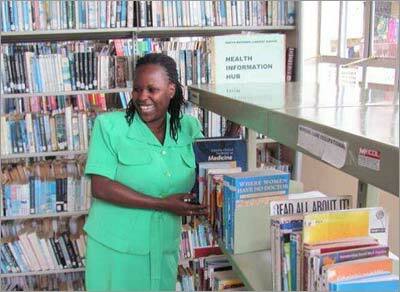 He is a librarian, a health information specialist and trainer with over 15 years' experience working across Africa. 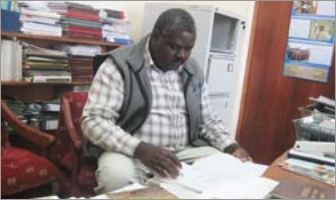 From 2010 to 2013, he worked with the with the Kenya National Library Service (KNLS) team to manage the Health Hubs project, train the librarians and health workers monitor and evaluate the project's outcomes. This is quite interesting. This has worked to aid the processes of devolving information to this the lowest unit inturn giving access to information as is Envisioned in the Constitution of Kenya 2010. How do we use this as a best practice to ensure that Human Resources for Health in Kenya can also be devolved?